This work occupies the summit of a lofty, detached hill, twelve miles westward from the city of Chillicothe, near the village of Bourneville. The hill is not far from four hundred feet in perpendicular height; and is remarkable, even among the steep hills of the West, for the general abruptness of its sides, which at some points are absolutely inaccessible. It is the advance point of a range of hills, situated between the narrow valleys of two small creeks; and projects midway into the broad valley of Paint creek, so as to constitute its most prominent natural feature. It is a conspicuous object from every point of view. Its summit is a wide and fertile plain, with occasional considerable depressions, some of which contain water during the entire year. 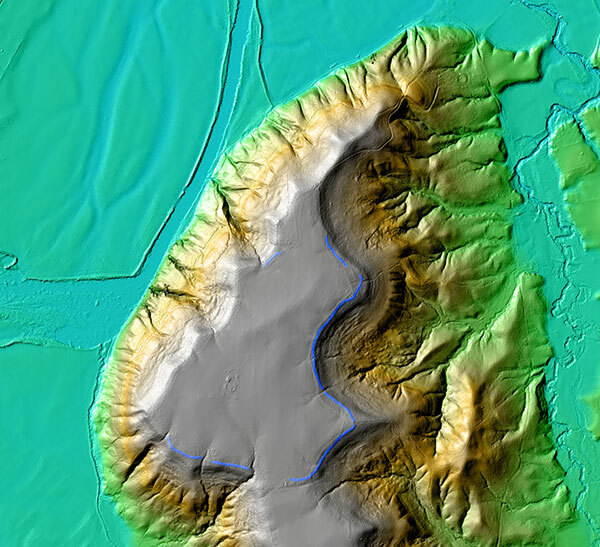 This is a Lidar image of Spruce hill. The site has mostly been destroyed, but there appears to be some vague outlines of the original walls which have been highlighted in blue. The defences consist of a wall of stone which is carried around the hill, a little below the brow; but at some places it rises, so as to cut off the narrow spurs, and extends across the neck that connects the hill with the range beyond. It should not be understood by the term wall, that, at this time, anything like a wall of stones regularly laid up exists; on the contrary, where the line is best preserved, there is little evidence that the stones were laid one upon the other so as to present vertical faces, much less that they were cemented in place. At a few points, however, more particularly at the isthmus D, there are some indications of arrangement in the stones, tending to the belief that the wall here may have been regularly faced on the exterior. The appearance of the line, for the most part, is just what might be expected from the falling outwards of a wall of stones placed, as this was, upon the declivity of a hill. Upon the western, or steepest face of the hill, the range of stones covers a space varying from thirty to fifty feet in width, closely resembling the "protection walls" carried along the embankments of rail-roads and canals, where exposed to the action of rivers or large streams. But for the amount of stones, it might be taken for a natural feature,—the debris of the out-cropping sand strata. Such, certainly, is the first impression which it produces upon the visitor; an impression, however, which is speedily corrected upon reaching the points where the supposed line of debris, rising upon the spurs, forms curved gateways, and then resumes its course as before. It will be observed that the wall is interrupted for some distance at E, where the hill is precipitous and inaccessible. There are, as has already been remarked, several depressions upon the hill which contain constant supplies of water. One of them covers about two acres, and furnishes a supply estimated by the proprietor as adequate to the wants of a thousand head of cattle. Water is obtained in abundance at the depth of twenty feet. The area enclosed within this singular work is something over one hundred and forty acres, and the line of the wall measures upwards of two and a quarter miles in length. Most of the wall, and a large portion of the area, are still covered with a heavy primitive forest. Trees of the largest size grow on the line, twisting their roots among the stones, some of which are firmly imbedded in their trunks. That this work was designed for defence, will hardly admit of doubt; the fact is sufficiently established, not less by the natural strength of the position, than by the character of the defences. Of the original construction of the wall, now so completely in ruins, we can of course form no very clear conception. It is possible that it was once regularly laid up; but it seems that, if such were ever the case, some satisfactory evidence of the fact would still be discoverable. We must consider, however, that it is situated upon a yielding and disintegrating declivity; and that successive forests, in their growth and prostration, aided by the action of the elements, in the long period which, must certainly have elapsed since its construction, would have been adequate to the total demolition of structures more solid and enduring than we are justified in supposing any of the stone works of the ancient people to have been. The stones are of all sizes, and sufficiently abundant to have originally formed walls eight feet high, by perhaps an equal base. At some points, substantial fence-lines have been built from them, without sensibly diminishing their numbers. It can readily be perceived that, upon a steep declivity, such as this hill presents, so large an amount of stones, even though simply heaped together, must have proved an almost insurmountable impediment in the way of an assailant, especially if they were crowned by palisades. In the magnitude of the area enclosed, this work exceeds any hill-work now known in the country; although the wall is considerably less in length than that of "Fort Ancient," on the Little Miami river. It evinces great labor, and bears the impress of a numerous people. The valley in which it is situated was a favorite one with the race of the mounds; and the hill overlooks a number of extensive groups of ancient works, the bearings of which are indicated by arrows on the plan. Paint creek washes the base of the hill upon the left, and has for some distance worn away the argillaceous slate rock, so as to leave a mural front of from fifty to seventy-five feet in height. It has also uncovered a range of septaria, occurring near the base of the slate stratum; a number of which, of large size, are to be seen in the bed of the creek, at a. These, most unaccountably, have been mistaken for works of art,—"stone covers" for deep wells sunk in the rock. This notion has been gravely advanced in print; and the humble septaria, promoted to a high standing amongst the antiquities of America, now figure prominently in every work of speculations on the subject. The reason for sinking wells in the bed of a creek, was probably never very obvious to any mind. The supposed "wells" are simple casts of huge septaria, which have been dislodged from their beds; the cyclopean "covers" are septaria which have resisted the disintegrating action of the water, and still retain their places. Parallel ranges of these singular natural productions run through the slate strata of this region: they are of an oblate-spheroidal figure, some of them measuring from nine to twelve feet in circumference. They frequently have apertures or hollows in their middle, with radiating fissures, filled with crystalline spar or sulphate of baryta. These fissures sometimes extend beyond them, in the slate rock, constituting the "good joints" mentioned by some writers. The slate layers are not interrupted by these productions, but are bent or wrapped around them. The following cut illustrates their character. A is a vertical section: a exhibiting the water, b the rock. At c the septarium has disintegrated, or has been removed, and its cavity or bed is filled with pebbles. At d the nodule still remains. B exhibits the appearance presented by d from above. A stone work, somewhat similar in character to that here described, exists near the town of Somerset, Perry county, Ohio. It is described by Mr. Atwater in the Archwologia Americana, vol. i. p. 131. Still another, of small size and irregular outline, is situated on Beaver creek, a branch of the Great Kenhawa, in Fayette county, Virginia, of which an account was published by Mr. I. Craig of Pittsburgh, in the "American Pioneer," vol. i. p. 199. 10. 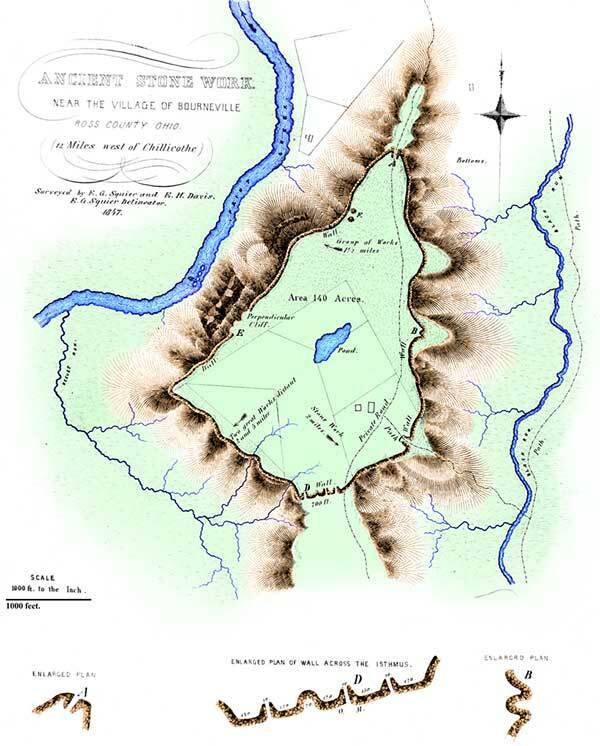 This Work is marked C in the "Map of a Section of Six Miles of the Paint Creek Valley," Plate III. 11. It has been suggested that perhaps the walls of stone were sustained or surmounted by wooden structures of some sort, the destruction of which, in whole or in part, by fire, caused the appearances noticed in the text. The suggestion that these are the traces of "ancient furnaces," is not to be entertained for an instant.